Gangtok, July 13/ 197th birth anniversary of Nepali poet Bhanu Bhakta Acharya was celebrated throughout Sikkim with pomp and glory. The main function this year was organized at Gyalshing, West Sikkim. The Chief Guest of the occasion was Chief Minister Pawan Chamling. The significance of the day was the inauguration and Nepali cultural centre and the unveiling of the bust of poet Bhanubhakta. While addressing the function, tt the capital city here organized Nepali Sahitya parishad, Governor Balimiki Singh stressed the need to observe this occasion as the festival of knowledge. The prominent personalities and dignitaries offered the Khada paying tribute to the poet. In the morning session, the cultural procession started right from the Bhanu premise where the full sized bust of poet Bhanu is installed. 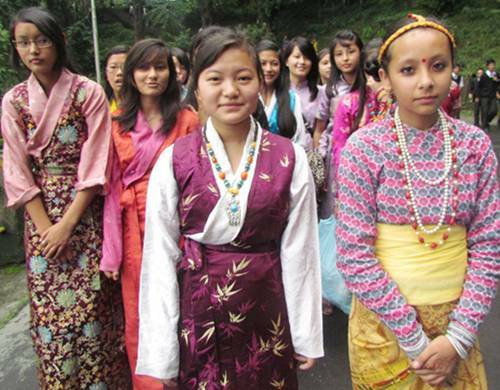 Many school children and the persons representing various organizations actively took part in the cultural procession. The young boys and girls sung with their high voice and great enthusiasm on the street playing drum and Madal, an nepali musical instrument. In the day, Inter secondary school and open cultural competition was organized at M.G. Marg. In the after noon session, a function was orgaganized at TNA hall, Gangtok. Shri Pradhumna Shresta was awarded with Bhanu Pursakar award, while Dup Tsering Lepcha was honoured with Sahitya Seva Award, B.P. Kanel with Patrakarshri Award, Tika Dungel with srijanshil Sahitya award and Karma Tshering Bhutia with Kala Shri award. The winners of Ramayan recitation competition and poetry competition too placed their presentation. The Chief Guest of the occasion was the Sikkim Assembly Speaker K.T. Gyalten. In his speech, the speaker Gyalten highlighted the importance of observing Bhanu Jayanti. Mr. B.K. Roka, the president of Nepali Sahitya Parishad thanked the people for the success of the function. In Gyezing, Mr. Kamal Mani Dikchit, Mr. Bairagi Kaila, the prominent literary figures from Kathmandu, Nepal and Indra Bahadur Rai from Darjeeling were honoured in the function. The grand sons of poet Bhanubhakta were also present on the occasion.